Friends received an interesting comment to one of our previous posts about “Fraud, or honest mistake“. One could conclude someone is not happy with Mr. Steven Samblis for some reason. A previous investor perhaps ? Anyway… the comment is show below (click to enlarge), and available at the above referenced link. When Friends checked Wilipedia (HERE), apparently CinemaNow is owned by FilmonTV. The quote from the Wikipedia page is: “By January 2016, Regent Equity Partners had sold CinemaNow to the UK-based company Filmon.” Yes, that appears to be the very same Filmon that was touted as the huge money maker for the stockholders of IMTV a while back. 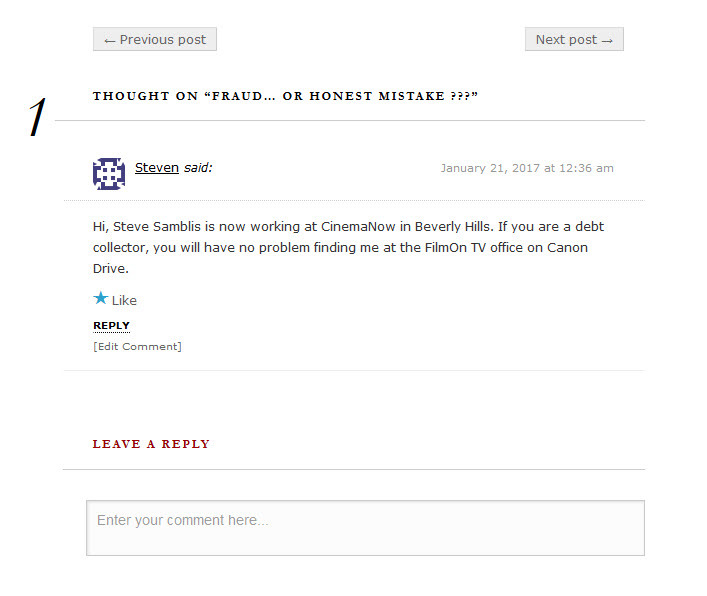 The comment to the post appears to be saying… Mr. Steven Samblis is a W-2 employee of the company CinemaNow, although the CinemaNow website doesn’t list any employees. Given the poster’s reference to the “debt collector” aspect, the poster seems to suggest that anyone holding a judgement against Mr. Steven Samblis could now garnish his wages to collect. We have reported on more than one judgement against Mr. Steven Samblis within this blog, and to review such simply put the word Judgement in the search box at the top right of this page and you can view the details and documents surrounding such. It would seem to be a fair question to ask… what was the relationship to Filmon back then, and what is the relationship now. Mr. Steven Samblis has promoted the idea that he has sold IMTV, and that he has no part in running the company. This alleged relationship seems to bring that into question again. Although the poster does not indicate what position Mr. Samblis holds there, and there is no reference to any employees, staff, or ownership (other than Filmon) on the CinemaNow website. One wonders though if Mr. Samblis holds any kind of management position, and is responsible for any management decisions. One also wonders if the company CinemaNow did any investigative background check in order to determine Mr. Samblis’s previous business experience and achievements relating to his management of the IMTV film and broadcast efforts. Or, the financial and accounting questions that arose from his management of IMTV, and the investor funds thereof. Perhaps the poster of the comment will elaborate further at a later date. We will certainly keep the readers of this blog up to date on any information relative to Mr. Steven Samblis and/or IMTV. If you want to know as soon as we post something, be sure to sign up for alerts.